Camping Rialto is the best departure point to visit the wonderful city of Venice. Camping Rialto is easy to reach from the train station of Venezia Santa Lucia or Venezia Mestre as well as from Venice Marco Polo or Treviso Airport. Surrounded in a green area perfectly shaded, here you will breathe a friendly atmosphere, ideal for relaxing after an intensive day excursion to Venice. Camping rialto offers a nice bar pizzeriarestaurant with terrace facing the pretty and well cared campsite garden, where you can have a good Italian coffee or cappuccino in the morning, a cold drink when coming back from Venice and in the evening taste the best pizza ever or our specialities at the restaurant! Having a good drink or an ice, you will be able to use our wi-fi connection service comfortably seated, or just have a chat with other guests of the campsite hearing good music. Clean bathrooms facilities and laundry facilities available 24 hours. 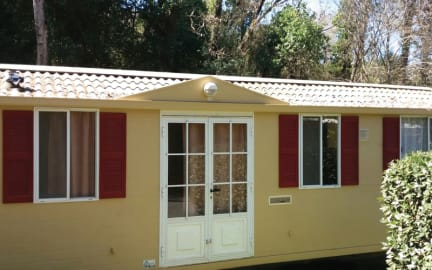 Full comfort Mobile Home composed by one room with a double bed, one room with two single beds, dining room with kitchen and living room, one bathroom with a wc and one bathroom with a shower. Ideal for a small group of friends or for a large family...your home away from home! Bed sheets and blankets are provided. Glamping is the combination of the two words Glamour and Camping. When you are glamping, there is no tent, no pitch, no sleeping bag to unroll. Whether in a bungalow-tent, glamping is a way to experience the great outdoors without sacrificing comfort. Mini-chalet for 2 persons: wooden mini-chalet for 2 persons with 2 twin beds no ensuite. Mini-chalet for 3 persons: wooden mini-chalet for 3 persons with one single bed and one bunk bed, no ensuite. 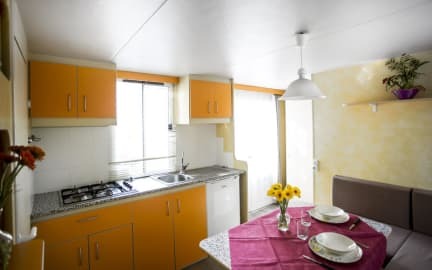 Chalets for 5 persons composed by a wide one room with one double bed, one bunk bed, kitchen, bathroom with shower, air conditioning and heater. Private rental tents for 2 persons: private comfortable tent for 2 persons with two real single beds located close by the toilet and showers facilities. Bed sheets, pillows and blankets are provided. Single rental tents for 1 person only: comfortable tent for solo traveller with one real bed located close by the toilet and showers facilities. Bed sheets pillows and blankets are provided. Towels for rent (extra cost). Check in is from 15.00 p.m. to 12.00 a.m., check out is strictly by 11.00 a.m. In case of early arrival you will be able to store your luggage by our luggage room while visiting Venice with an extra cost. In case of late check in (we kindly ask to get notification about this), you will be able to check in with our night guard. The booking can be cancelled up to 24 hrs in advance to avoid any penalty. In case of no show or late cancellation you will be charged for the first night accommodation. Possibility of car or motorbike parking. The parking fee will be calculated as an extra on your bill (€ 5.50/€ 7.00 per night). Dogs are allowed with an extra charge of euro 2.50 per dog per night. Touristic tax is not included in the price. An extra amount of euro 0.10 per person over 17 years old per night will be requested on check out. A fee of euro 0.40 per person per night will be charged on the final invoice for the waste disposal. Camping Rialto is the best typical Italian friendly, clean and safe place for your stay in Venice you will feel like home! Excellent location to get to Venice and great value for money! EASTER: 21st of April 2019. Enjoy Venice in spring time! Visit the wonderful city of Venice in the best period of the year. 58. INTERNATIONAL ART EXHIBITION (BIENNALE) – MAY YOU LIVE IN INTERESTING TIMES is the title chosen by Ralph Rugoff, curator of the exhibition. The exhibition will take place from the 11th of May to the 2th of November 2019. VOGALONGA 09.06.2019 Are you taking part of the biggest rowing event of Venice alone or with your rowing team? Book Camping Rialto! FESTA DEL REDENTORE 20.07.2019 enjoy the fireworks from Saint Mark’s square! HISTORICAL REGATTA: "REGATA STORICA" on the 1st of September 2019: brightly colored rowing competition and parade. The staff was amazing! So kind and ready to help with whatever we needed! Because we were staying in a tent it was a little chilly (but it was the last weekend of september..) but we were able to get some extra blankets free of charge. Their croissants and hot chocolate were to DIE for! Thank you so much for an excellent weekend! Everything amazing, besides sick pricing for laundry, food etc. but you can live without that. And if you pick private tent: - Blankets are too small for very tall people - Bring your own sleeping bag because they give you only pillow and blanket. Besides that, amazing place, they have authorized bus tickets, bus stop LITERALLY five meters from entrance - great! You should warn travellers that mid-September it gets very, very cold at night. But that has nothing to do with your camping, just a side note. We stayed in a wooden hut and it was very,very cold, only one plug socket, which was the one the radiator plugged into. However very lovely staff and great location, with a Lidl just opposite the road. We stayed in the camp and expected it to be bigger but it was just a decent tent to stay for a night. For those looking for a place to stay more than a night, I think the chalet would be better. Overall was a decent place to stay, close to the bus stop. The staffs were very helpful! They helped us cal the taxi as we were late for our train. Great Value for the price!! however, not a good choice outside of summer. we went mid september and it was sooooooooooo cold!!! we had to sleep with coats on. they have a restaurant on site that is AMAZING. Pizzas are a must try!! A nice place for a low cost trip. Very near to the airport is the best thing.